POWERAXIS - High quality cells, tested by manufacturer to match OEM products, CE and RoHS certified, high capacity battery for longer running time. Products are fcC, as good as even better than the originals. Compatible with original manufacturer equipments and chargers, If you don't plan on using the Battery for a month or more, store it away from heat and metal object. Replacement part number: makita 1420 1422 1433 1434 1435 1435f pa14 192699-a 193158-3 192600-1 193062-6 194172-2 193985-8 compatible with :please use "ctrl + f " makita 5094dwd, 6237d, 6935fdwde, 6237dwde, 6933fd, 6934fd, 1051dz, 6337dwfe, 8433dwfe makita jr series:jr140d, 4332d, 6381d, 6228dwbe, 6233d, 6233dwbe, 6336dwde, jr140dwb, 1051dwde, 6236dwbe, 6336dwb, 6228dw, 4033dz makita 6000 series:6228d, 6333dwbe, 6333d, 4333dwde, 6932fd, 6236dwde, 6336dwbe, 1051dwf, 6339dwde, 6932fdwde, makita ub140dwb makita 1051 series:1051d, 6281d, 6336d, 4333dwd, jr140dwbe, makita ml143flashlight makita ub140d, makita 5630dwd makita ml140flashlight, 1051dwfe makita 4000 series:4033d, 1051DWD, 4333D, 8433DWDE, 6935FDWDEX Makita 8433 Series:8433D, 6337DWDE, 6337D, JR140DWD Package: 1x Poweraxis Makita 1420 BatteryWarranty: We guarantee to provide brand new high quality replacement batteries with REAL SPECIFICATIONS! 30 Days money back. POWERAXIS 2 Packs Makita 14.4V 3.0Ah High Capcity NI-MH Power Tool Battery Replacement for Makita 1420, 1422, 1433, 1434, 1435, 1435F, 192699-A,193158-3,192600-1 Cordless Power Tool Red - 1 year warranty;any issues emails will be replied in 12 hours Rechargeable power tool battery, wattage: 43. 2watts, capacity: 3000mah, battery Type: Ni-MH, Voltage: 14.4v, color: Red. Compatible part number:makita 1420, Please see full list of compatible models in the Product Description. About poweraxis: poweraxis is specilized in design and manufacture varieties of batteries for power tool with good quality since 1998 ; As a top supplier of replacement power tool battery and charger, AEG, Atlas Copco, Lincoln, Paslode, Dewalt, Black&Decker, Milwaukee, Hilti, Metabo, Ryobi, Makita, Skil, our product range covers every popular brand: Bosch, Ramset, Panasonic, Hitachi, and Max. Makita DC1804 - Charges makita batteries - 7. 2volt through 18-Volt. Universal voltage super high capacity charger; for all 7. 2volt to 18volt batteries, stick and pod styles. Ni-mh & ni-cd battery charger for all Makita stick and pod style batteries. Works on makita ni-cd & Mi-MH Stick & Pod style batteries. Powerextra MA9000-30*2 - Charges makita batteries - 7. 2volt through 18-Volt. Brand new |rechargeable ni-mh|9. 6 volts |3000 mAh |28. 8wh. Fits for : please use "ctrl + f" to search makita 4190d makita 4190dw makita 4300d makita 4300dw makita 4390d makita 4390dw makita 5090d makita 5090dw makita 6012hd makita 6012hdw makita 6092d makita 6092dw makita 6093d makita 6093dw makita 6094d makita 6094dw makita 6095d makita 6095dw makita 6095dwbe makita 6096d makita 6096dw makita 6096dwbe makita 6096dwe makita 6096dwle makita 6891d makita 6891dw makita 6900d makita 6900dw makita 8400d makita 8402dw makita 8402vd makita 8402vdw makita 903d makita 903dw makita da390d makita da390dw makita da391d makita da391dw makita ml900 Flashlight Makita ML902 Flashlight Makita T220D Makita T220DW Compatible Part Numbers : 191681-2, 9033, 9001, 9002, 632007-4, 9000, 9600 Package Includes : 2 x packS of batteries 1 x pair of gloves Warranty : We guarantee to provide brand new high quality replacement batteries with REAL SPECIFICATIONS All Powerextra products come with a 30-day money back and a 12-month limited seller's guarantee against manufacturer defects from date of purchase, and 24 hours' friendly customer service! Ni-mh & ni-cd battery charger for all Makita stick and pod style batteries. Works on makita ni-cd & Mi-MH Stick & Pod style batteries. Powerextra focus on providing high quality power products and excellent customer service, Looking forward to your support and your positive affirmation. About powerextra: powerextra is specialized in manufacturing power tool batteries Powerextra is one of top selling brands for replacement batteries at amazon Powerextra products are made with the highest quality materials. Powerextra 9.6v 3000mAh Replacement Battery Compatible with Makita 9000 9033 193890-9 192696-2 632007-4 2pack - Our products are ce certified, tested by manufacturer to match and/or exceed specifications of OEM products. Professional replacement battery for makita 9000, 9002, 191681-2, 9001, 9033, 9600, 632007-4. CXAB 1822 - Top a grade battery cells built-in integrated microchip prevents overcharging and self-discharge. Compatible battery:for makita pa18, sc190dwde, jr180dwbe, 8390dwae, 8444dwfels711d, ls800dwd, 4334dwde, 5036dwfe, 193140-2, 6347dwfe, 8391dwpe, 5621dwd6343d, 5046dwde, 193102-0, 192827-3, 1823, 6343dwde, sc190dwa, 5046db, 5026dwfe, 6343dwb, 1835f, 5046dwd, 8443dwfe, ls711dwbek, 1835, 193783-0, 8391d, 6349dwfe, 5046dwb, ls800dwb, ls711dwa, 194158-6, 193784-8compatible fit model: please use ctrl + f to searchfor makita 18-volt cordless power tools4334d, ml183 flashlight, ml180jr180d, 4334dwd, 8443dwde, 192829-9, 6347dwde, 194105-7, jr180dwa, 5026dwb, jr180dwae, 1822, 5026dwd, ls711dz, 6391d8390d, 5036db, 8444dwde, 6343dbe, 193061-8, 6343dwfe, 1833, jr180dwb, ls800dwbe, 1834, jr180dwd, 193159-1, 4334dwd, 5036dwb, 6347d, 6349dwde, 5620dwd, 5046DWFE, LS800D, 192828-1, 8443D, 4334DWDE5026DB, 5036DWD, 192826-5, UB181D Package Includes:2 * 18V 3. 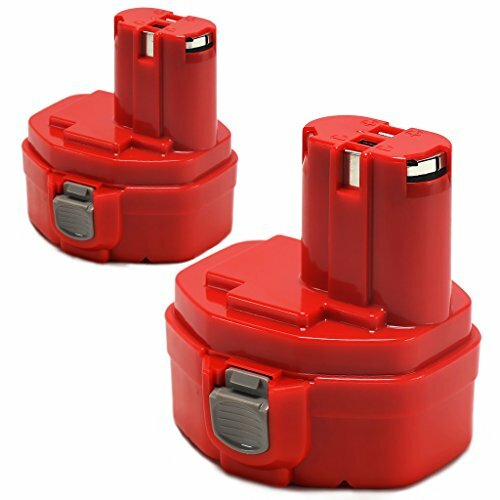 0ah cordless nicd batteries for makita 18-Volt Cordless Power Tools Ni-mh & ni-cd battery charger for all Makita stick and pod style batteries. Works on makita ni-cd & Mi-MH Stick & Pod style batteries. Professional replacement Power Tool Battery for Makita 18-Volt Cordless Tool Batteries. 3. 0ah nicd battery delivers Maximum Runtime for Heavy Applications. Biswaye 2 Pack 1822 Replacement Battery 18V 3000mAh for Makita 1823 1833 1834 1835 1835F 192828-1 192829-9 193061-8 193102-0 193140-2 193159-1 193783-0 - All biswaye battery packs comply with FCC RoHS and CE security testing standards. As a professional manufacturer of power tool batteries and chargers Biswaye specialize in designing and manufacturing varieties of power tool batteries and chargers with high quality and competitive price. Shentec 9000 - Professional replacement Power Tool Battery for Makita 18-Volt Cordless Tool Batteries. Work with original charger. No memory effect and low self-discharge for maximum productivity and less downtime. Ce, fcc and rohs certified, 100% compatible with the originals. Low self-discharge for maximum productivity and less downtime. For transport safety, our batteries are not fully charged before leave the factory. Voltage: 9. 6v, capacity: 3000mah, battery type: ni-mh, Package: 2-pack. Compatible with makita 9. 6v battery 9000 9001 9002 9033 9600 193890-9 192696-2 632007-4. Fully compatible with makita 4190d, Makita 5090D, makita 4300D, etc. Shentec 2 Pack 3000mAh 9.6V Battery Compatible with Makita 9.6 Volt 9000 9001 9002 9033 9600 193890-9 192696-2 632007-4, Ni-MH Battery Pack - After use, please charge the battery after cooling. No memory effect, can be charged or discharged as needed without loss of capacity. Charges makita batteries - 7. 2volt through 18-Volt. Brand new |rechargeable ni-mh|9. 6 volts |3000 mAh |28. 8wh. ExpertPower I0IBTGMK143330H - Professional replacement battery for makita 9000, 9001, 191681-2, 9600, 9002, 9033, 632007-4. Fully compatible with makita 4190D, Makita 5090D, Makita 4300D, etc. Compatible with makita original charger, fit DC1804, FP1804F. Products are ce certified, tested by manufacturer to match or exceed specifications of OEM products. Brand new| rechargeable| nicd battery| 18 Volts| 3. 0ah| replacement Battery for Makita. Feel free to contact us for testing data. Note: your charger may not support Ni-Mh technology. Ni-mh & ni-cd battery charger for all Makita stick and pod style batteries. Works on makita ni-cd & Mi-MH Stick & Pod style batteries. 2 Pack ExpertPower 14.4v 3000mAh NiMh Extended Battery for Makita 1433 1434 1435 1435F 192699-A 193158-3 - Replacement part #: 1433, 1422, 1435, 192600-1, 193158-3, 1435f, 1420, 1434, 194172-2, 192699-A. We guaranty every battery we sell 100% matches label capacity stated. 100% qc of this cordless tool battery, 30-day money back and a 12 months limited warranty! Work with original charger. No memory effect and low self-discharge for maximum productivity and less downtime. Ce, fcc and rohs certified, 100% compatible with the originals. Brand new / ni-mh / 3000 mah / 14.